Fantastic Winter Get Away, in a fabulous development, ideal location with gulf side views to wake up to every morning. Are you a snowbird looking for a great place available this winter? This is the place!!! Directly on the BEACH!!! Fabulous 5 th floor unit on gulf side in desirable Island Reef complex. Our unit offers a master suite with king size bed as well as a second bedroom and bath. The second bedroom has two new queen size beds. High speed internet connection is included with access to wireless network. The unit boasts new stainless steel kitchen appliances, new washer/dryer, and a big-screen plasma television.T.V. 's in both bedrooms, DVD players, Stereo. Newly Remodeled, also included all new linens and towels. Kitchen completely furnished. You won't believe the views from our lanai, master bedroom, out our back door, or breakfast nook until you see them for yourself. Island Reef's Amenities include many social events, tennis courts, 2 heated swimming pools, fitness center,shuffle board, billiard and card rooms, barbeque areas, saunas private beach, boat docks and large club house. We are just minutes away from some of the areas finest restaurants, shopping and golf courses. Please email us with any questions. Please note, we only offer monthly rentals. Complex has two pools, tennis courts, shuffle board, and a fitness center, boat docks, private beach, and many social events to take adavantage of. Our unit also has two queen beds in the second bed room, high speed internet with wireless network, new kitchen appliances, and big screen plasma television. 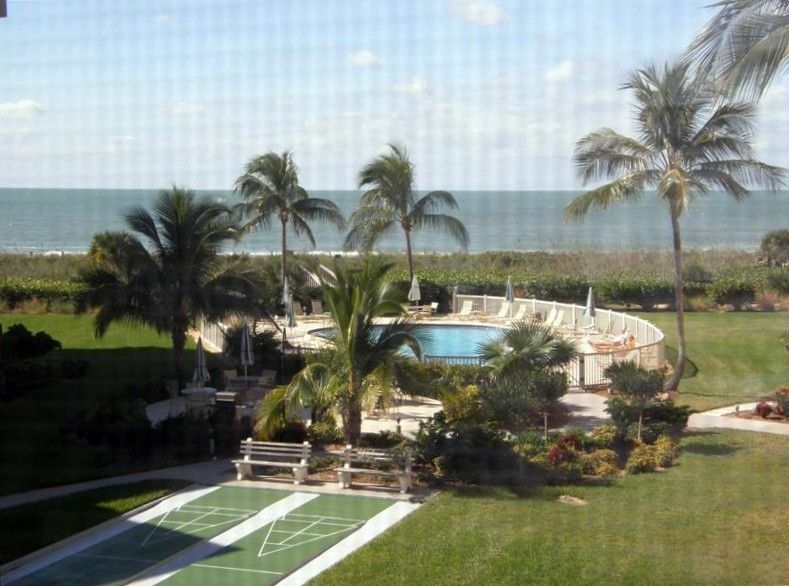 Great condo, beautiful grounds, steps to the beach & many activities to get involved in! Beautiful views from the spacious & well equipped condo. Grounds are gorgeous & steps to the beach. Many activities to get involved in if you choose. Loved our time in paradise & will be returning next year! For the last few years (and next year too) my wife and I have stayed in this condo. This condo is immaculate. The kitchen is extremely well equipped with all the things you'd need. The living room is spacious and has plenty of comfortable furniture. It has a nice flat screen tv and Internet wifi. The lanai overlooks the pool and has a good view of the gulf. The second bedroom (which has two queen beds) and separate kitchen seating area also have great gulf views. The location is wonderful. It is on the quiet end of siesta key, but still has several restaurants and a beautiful park within walking distance. Sarasota is just a short drive away with a myriad of activities and restaurants. And don't miss the Farmers market on Saturdays in downtown Sarasota. Even if you don't buy anything it's a fun time. The owner Tony and his daughter, Heather, couldn't be nicer or more accommodating. I think the best recommendation I can give is; we will be going back again in 2017. We love it there! Heather's families condo was far better than we expected. It was very spacious and very clean, I honestly can't say enough great things about the condo itself. You really don't need to bring anything but food and clothes, the condo had it all. One thing I forgot to mention to Heather.... just be careful when using the dryer, try not to put anything with a string in it. We ruined a couple a shorts and shirts with pull strings because they got caught up in the door area of the dryer and were torn off. This is nit-picky but good to know. The 5th floor is nice, the views are ok..... the front door view is better than the balcony view. If you are there to sit on the lanai then you will be limited to seeing the gulf, the unit is actually to the far left of the picture shown, with only about a 1/3 of the view. We weren't able to hear the gulf waves either, and this had nothing to do with the condo.... sadly storms have formed a 5 foot wall of sand down on the beach, cutting the beach size in half, but also stopping the sounds from even reaching the pool area. Again, all minor things.... depends on your preferences. The location of the condo was great, far to the south of all the noise of Siesta Key and Crescent beaches, but only a 10 minute drive. Siesta Key and Crescent beaches offer the traditional white soft sand that I'm sure most beach goers expect. Island Reef is on Turtle beach, and the sand there is dark and very very hot, you will need shoes. The pool was huge, with more than enough room for multiple people, and very well maintained, with nice bathrooms as well. The complex has shuffleboard, ping pong, and tennis courts, all of which we used. The grills are located by the pool with tables big enough for a large family. Overall our family had a great vacation! We spent a month at this rental. It is much bigger than it looks in the pictures. It is very well-stocked and comfortable. The kitchen had everything needed to cook any meal. It was nice to have beach chairs, umbrella and beach and pool toys for the kids. The beach was right beside the condo and easy to walk to. The pool was great. The pool water was heated and comfortable. Our grand kids loved it! We really enjoyed the open air balcony as well. The only disadvantage of this condo is the distance to groceries and restaurants. It would have been nice to have something within walking distance. It was a five minute drive to the 7-11 and 10 minutes to Publix and many popular restaurants. It was a great vacation and any concerns we had were looked after quickly and to our satisfaction. Hi Shirley, Glad to hear that you enjoyed your stay at our condo. Hope to have you back again sometime. My family and I had a wonderful stay at Island Reef. The unit is clean, well stocked, and spacious. The views from the front and back are spectacular. Unit also has bikes available for use. Beach is private and one of a kind. Will definitely come back!